Four in five organizations reported facing some form of network- or application-based cyberattack in 2017, according to Radware’s 2017-2018 Global Application & Network Security Report. Zero-day malware, botnets and Burst attacks – all sterling examples of automated attack vectors – saw significant increases in usage in 2017, according to the same report. The numbers don’t lie. Cyber criminals are becoming savvier and their attacks increasingly automated. Furthermore, it’s evident that traditional DDoS mitigation methods, such as rate-based or manually-tuned protection, are outdated solutions to safeguard sensitive data in the wake of automated cyberattacks. Additionally, their ability to make quick and impactful decisions to manually address an attack is equally inefficient. Research shows that machine-learning botnets are now capable, in certain situations, of scanning a network for vulnerabilities and successfully breaching its defenses in less than 20 seconds. This is why automation is becoming such a powerful and effective component of cybersecurity. To combat the onslaught of incoming threats, organizations must employ an army of equivalent strength and sophistication. At the forefront are botnets, which are increasingly sophisticated, lethal and highly automated digitized armies running amok over corporate networks. For example, hackers now leverage botnets to conduct early exploitation and network reconnaissance prior to unleashing an attack. The Mirai botnet, which was made famous by its use in the 2016 attack on DNS provider Dyn, and its subsequent variants, embodies many of these characteristics. It leverages the infamous Water Torture attack to generate randomized domain names on a DNS infrastructure. Follow up variants use automation to allow the malware to craft malicious queries in real-time. Modern day malware is an equally sophisticated multi-vector cyberattack weapon designed to elude detection using an array of evasion tools and camouflage techniques. Hackers now leverage machine learning to create custom malware that defeats anti-malware defenses. One example is Generative Adversarial Network algorithms that can bypass black-box machine learning models. In another example, a cybersecurity company adapted Elon Musk’s OpenAI framework to create forms of malware that mitigation solutions couldn’t detect. Executives clearly understand this and are ready to take advantage of automation. 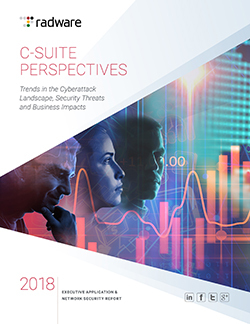 According to Radware’s C-Suite Perspectives: Trends in the Cyberattack Landscape, Security Threats and Business Impacts, the vast majority of executives (71%) report shifting more of their network security budget into technologies that employ machine learning and automation. The need to protect increasingly heterogeneous infrastructures, a shortage in cybersecurity talent and increasingly dangerous cyber threats were indicated as the primary drivers for this fiscal shift. In addition, the trust factor is increasing. Four in 10 executives trust automated systems more than humans to protect their organization against cyberattacks, according to the same report.